The Ancient and Accepted Scottish Rite of Freemasonry, commonly known as simply the Scottish Rite, is one of several Rites of the worldwide fraternity known as Freemasonry. A Rite is a series of progressive degrees that are conferred by various Masonic organizations or bodies. The Scottish Rite is one of the bodies of Freemasonry that a Mason may join for further exposure to the principles of Freemasonry. 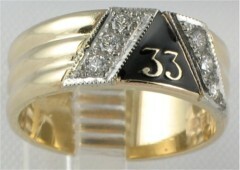 An example of the 33rd Degree Scottish Rite ring can be found at Fox Jewelry. What Is A Scottish Rite Mason? You are currently browsing the archives for the Scottish Rite category.